New Delhi: The Central Bureau of Investigation today arrested a Chartered Accountant of Udaipur and a real estate developer of Jaipur in the on-going investigation of a case relating to an alleged loss of Rs. 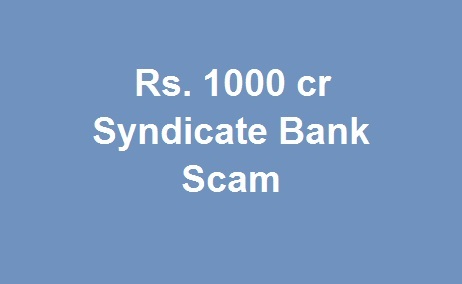 1000 Crore to Syndicate Bank. The arrested accused were produced today in the designated court at Jaipur (Rajasthan) and remanded to seven days police custody. During searches conducted in the course of further investigation, Rs. 66 lakh cash; certain electronic hard drives and incriminating documents were recovered from the premises of Chartered Accountant’s employees as the same was allegedly kept by him (Chartered Accountant). CBI had registered a case on a complaint from Syndicate Bank under sections 120-B read with 409, 420, 467, 468, 471 of IPC and Sec. 13(2) read with 13(1)(c) and (d) of Prevention of Corruption Act, 1988 against a former General Manager, FGM Office, Syndicate Bank, New Delhi; then DGM, Regional Office, Syndicate Bank Jaipur; then Chief Manager, MI Road Branch, Syndicate Bank, Jaipur; then AGM, Malviya Nagar Branch, Syndicate Bank, Jaipur; then AGM, Syndicate Bank, Udaipur; a Chartered Accountant & two private persons from Udaipur; a private person of Jaipur; certain private companies and other unknown public servants & private persons for causing an alleged loss of Rs.1000 crore (approx) to Syndicate Bank. It was alleged that the accused persons in connivance with the Bank officials committed a fraud of Rs.1000 crore by resorting to discounting of fake cheques & bills against fake letters of credit (LCs) and arranging over-draft limit against non-existent LIC Policies. The said fraud was allegedly committed at branches of Syndicate Bank at Malviya Nagar & MI road branches in Jaipur and Udaipur branch (Rajasthan). It was further alleged that since 2011, the bank officials of said branches at Jaipur & Udaipur colluded with private persons / customers and resorted to discounting of fake cheques, fake Inland Bills and arranging over-draft limit against non-existent LIC polices. The amount involved in individual transactions ranged from Rs. 40 lakhs to Rs. 5 crore but majority of them were in the range of Rs.2.5–4.0 crore. To avoid detection, many of these transactions were nullified from the proceeds of new fraudulent transactions. Searches were also conducted on 08.03.2016 at 10 locations including Jaipur, Udaipur and New Delhi which led to recovery of incriminating documents.